Roxanne Emmerich was recently honored by the National Speakers Association (NSA) Foundation with the Philanthropist of the Year Award at the 2010 NSA Convention in Orlando, Fla. 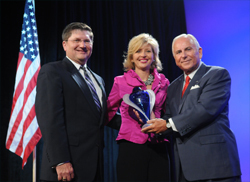 The Nido R. Qubein Philanthropist of the Year Award is the highest honor the NSA Foundation bestows on members of the National Speakers Association. This award honors continued commitment to the NSA Foundation as well as ongoing efforts to share the principles of philanthropy with NSA members around the world. Roxanne is committed to not only spin around the results of companies but to also turn around the lives of people and do everything she can to help disadvantaged college students secure scholarships so they have opportunities and options that would not otherwise be available to them. As she accepted her award, Roxanne challenged everyone to give unconditional love and make the masterful difference you were called in your heart to make. What are you going to do today to make a masterful difference in the world?